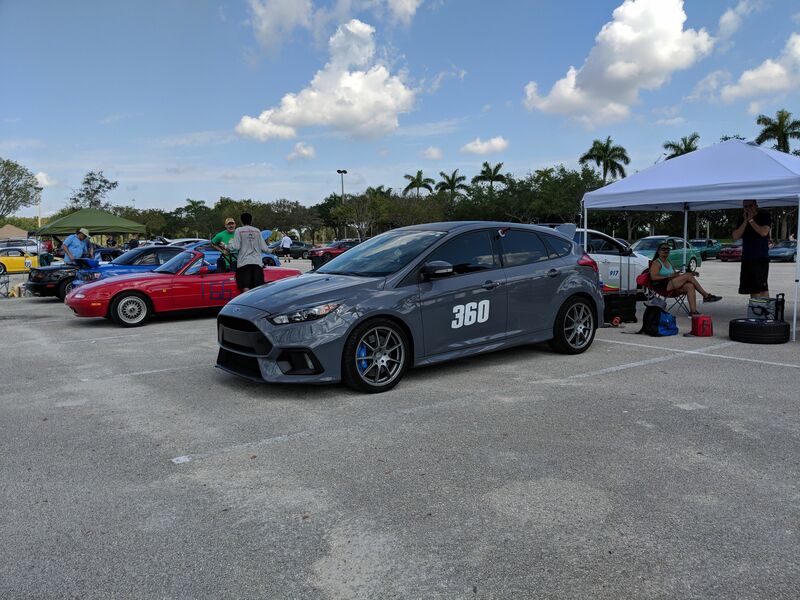 Street Racing Made Safe is one of my favorite local autocross groups here in South Florida. It’s a relaxed group that holds their events at local go kart tracks and usually get at least 10 timed runs and fun runs in the afternoon. These events provide a great chance to test new techniques and adjustments. I brought my Focus RS and a buddy of mine from the local ST/RS club brought his prepped SM class Focus ST. We had both been looking forward to this event because we had agreed to swap cars and experience something new. For me, a full bolt-on FWD Focus ST and for my friend, a mostly stock Focus RS. After we both had 6 runs in our own cars, we decided it was time we switched cars. It was then, that I quickly realized I had honed my driving style to an AWD drivetrain. My first run was just wheel spin and understeer city. Population: me. I was trying to power out of the corners too soon and trying to cut corners too close as if I was back in the RS relying on the all-wheel drive power to pull me through corners. In the second run with the ST I made some important adjustments. I knew where and what I needed to change in my driving. It was turn 2, coming out of a fast three cone slalom into a right hand 90 degree turn. This was where I made most of my mistakes in the previous run. This time, I started the turn a bit wider and tracked out a bit more to maintain more grip and speed. This was a big improvement from my previous run where I was spinning wheels mid-corner, understeering and fighting torque steer on the way out of the corner. Using that corner as an example, I applied similar techniques during the rest of the course. I managed to beat my previous run by 1 second and my best time in the RS by 2 tenths of a second! Although my friend’s Focus ST was modified to be in a faster class, there were a few key modifications and set up that I believe that set it apart from my BS spec’d Focus RS and they all attribute to grip. I managed to beat my previous run by 1 second and my best time in the RS by 2 tenths of a second! Swaybars. My friend took full advantage of installing front and rear swaybars. Whereas in my RS I regretfully have installed a rear swaybar instead of the front. This stiffened up the rear of the car too much and caused me to loose some grip and power to the wheels in sharp turns or slaloms by putting one rear wheel in the air. I don’t notice it while driving, but everyone shares pictures of me on three wheels instead of all four. Camber. The Focus RS comes stock without much room for adjustment more negative camber. Some owners had some luck getting about -1.6 degrees of camber in the front with the stock adjusting bolts. I haven’t touched mine, so I’d be happy to find out if I have any negative camber. My friend’s ST had some camber plates installed and setup with -3 degrees of camber in the front. His car was able to grip and maintain more speed through the corners. Tires. Of course it all comes down to tires. I play around with tire pressure and have found that dropping about 8psi from Ford’s stock recommendations seems to be optimal for my Michelin Pilot Sport 4S tires. Yet, I’m sometimes too aggressive and still end up rolling over the sidewalls. I know it’s not the best tire for street class, but my living situation only allows for one set of tires in my life. So compared that to my friend’s ST equipped with Falken Azenis 615 tires, I was unable to get sidewall roll over due to its stiffer sidewalls. Although I made adjustments to my driving style to improve my course times, I also discovered some key points that could be optimized and while staying in Street class. I can get a stiffer front swaybar or just disconnect the rear swaybar, try to get the most negative camber possible with stock tolerances, and get some stiffer sidewall tires. It was this memorable autocross where I experienced the noticeable differences first hand why set up for grip is important. Not just car setup or modifications, but setting myself up mentally for grip. In my case, adjusting my driving style for FWD as opposed to my conditioned driving for AWD.